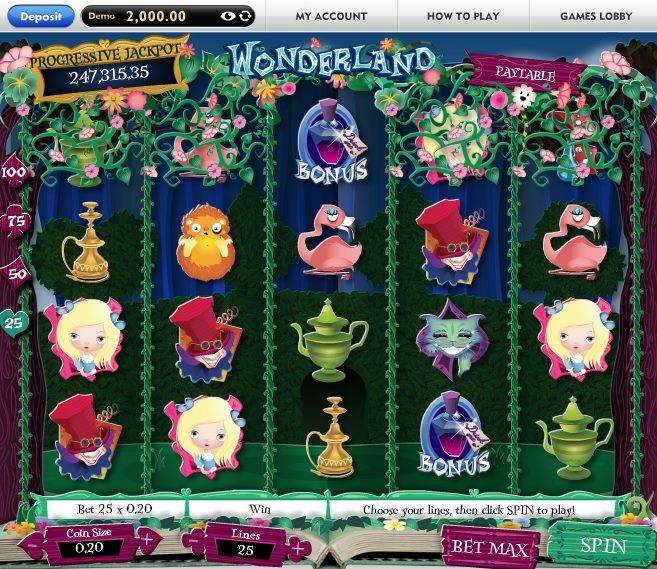 With four bonus rounds, and a genuinely innovative look which resembles a children's pop-up book, Wonderland from leading slots bods, Gamesys, is certainly one of the prettiest-looking games we've reviewed here at GamingSlots. Played out over 4 rows, 5 reels and a whopping 100 paylines, Wonderland is - as you can probably gauge from the title - based on Lewis Carroll's classic tales of Alice who, after one night too many clubbing, wakes up to find herself in a world of talking rabbits, grinning cats and evil playing cards. If there is one message to be learned from this online slots experience then it is certainly very clear here. Don't do drugs, kids! So - onto those wild and wacky graphics. Looking like they fell out of Microgaming's horror-themed slot, Halloweenies - all Tim Burton flourishes and all - let alone Alice in Wonderland, there are some incredibly drawn symbols, ranging from Alice herself and the Mad Hatter to the White Rabbit, the Cheshire Cat, the Hedgehog, a Flamingo, a Teapot, Tea Cup, some dodgy-looking mushrooms, and a Hookah smoking pipe. The Wild is the Cake icon and substitutes for all regular symbols other than the Drink Me Scatter. That Bonus Scatter is a bottle of purple liquid, three of which anywhere on the reels activates the multi-layered bonus features. First up is the Croquet Bonus round. Alice is taking on the Queen of Hearts in a game of croquet. Select which hoops you want your character to knock the balls through and win cash prizes for each one they successfully hit. If you win the game you get the chance to play a little bonus game, freeing hedgehogs the Queen has trapped (don't ask). If you free five you bag the progressive jackpot. The Mad Hatter's Tea Party Bonus feature has all the famous characters from the books. Another Pick' em Bonus, you must select teapots to reveal cash prizes. If the dormouse appears a mini-bonus game will trigger. Here, you choose a cupcake to reveal a bonus prize. However, if your cake contains a Progressive Coin you will win - surprise surprise - the progressive jackpot. A further Pick 'em Bonus sees you recreating the painting of the white roses from the stories. Click on each white rose to turn them red and win cash for every one you turn before the Queen pops up. Finally, the Queen's Court Bonus Feature is a straight 'Gamble' type round where you pick the next card to be higher or lower. Keep choosing and winning cash until the Queen appears and you're sent spinning to the base game. With such a multi-layered bonus feature structure, some potentially juicy progressives, plus really lovely graphics to ogle, it's hard to find anything against Wonderland. Oh, there are no free spins - yep, that'll do, no free spins. 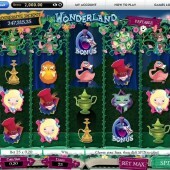 For additional Alice in Wonderland slots gaming it is worth your time checking out Ash Gaming's release of Alice's Wonderland.